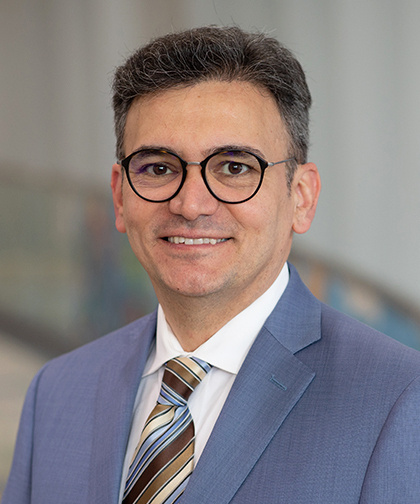 Ali Sadoughi, MD, specializes in interventional pulmonology, a subspecialty of pulmonary and critical care medicine that uses endoscopy and other minimally invasive tools to diagnose and treat patients with benign and malignant chest diseases. Dr. Sadoughi has special training in interventional pulmonology and is board certified in pulmonary disease, critical care medicine and internal medicine. Dr. Sadoughi is a graduate of Shahid Beheshti University of Medical Sciences in Iran, and he completed an internal medicine residency at Kingsbrook Jewish Medical Center, a pulmonary and critical care fellowship at Hofstra-North Shore LIJ School of Medicine, and an interventional pulmonary fellowship at Washington University in Saint Louis. Dr. Sadoughi has published papers in journals including Chest and Journal of Molecular Medicine and has made presentations at national medical meetings. He is also a member of professional societies such as the American Association of Bronchology and Interventional Pulmonology, the American College of Chest Physicians, the American Thoracic Society and the International Association for the Study of Lung Cancer.